Photo Courtesy Of The Great American Melodrama THINK OF THEM Franklin (Tim Stewart) fights to save his true love Christine (Katie Worley Beck, left) from the Phantom (Beau Heckman, right) in the Great American Melodrama's production of The Phantom of the Melodrama. Photo Courtesy Of The Great American Melodrama MAN WITH THE PLAN Mike Fiore as Peter Piper gives a refreshing comedic take on the semi-villainous theater owner whose plans to change the Melodrama draw the ire of the Phantom. Fiore and the rest of the cast can be seen in the production of The Phantom of the Melodrama, running through Nov. 12. 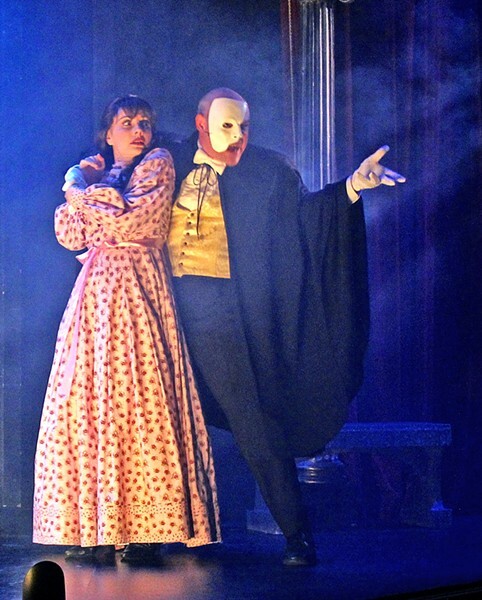 The Great American Melodrama presents The Phantom of the Melodrama through Nov. 12. Tickets are $20 to $27. The theater is located at 1863 Front St., Oceano. More info: americanmelodrama.com or 489-2499. The best thing about the Great American Melodrama is the wink they offer to the diehard theater geek—the one who sings "Memory" every time someone asks if they remember something, or the one whose Spotify playlist is nothing but the soundtracks to all five London revivals of Cabaret. The subtle nods to the most ecstatically beloved of musical or classic theater are what provide the sweet cherry on top of every production they roll out. That's certainly the case with The Phantom of the Melodrama, a musical within a musical based off one of the most famous Broadway musicals of all time, Andrew Lloyd Webber's The Phantom of the Opera. Phantom of the Melodrama starts with a rousing number of "Oceano" to the tune of "Oklahoma," which was funny and filled with the kind of "Central Coast, amirite?" jokes the Melodrama does so well. The show features the story of the production of the play A Vacant Outhouse in Fartsfield Landing, and the actors and theater workers trying to pull off the next show. Christine (Katie Worley Beck) is in love with Franklin (Tim Stewart), son of Charlotte Ruth (Jackie Hildebrand), who also happens to despise Christine. The actors are trying to rehearse for their next production aided by Megan (Rachel Tietz) and stagehand Joseph (Toby Tropper). Just as they get going, they are interrupted by Peter (Mike Fiore), who announces he's bought the theater and is turning it into a serious theater for Shakespeare. That irks the Phantom (Beau Heckman), who sets forth a series of weird events as part of his mysterious agenda. The production also marks the Melodrama debut of Abilene Olson, who is a powerhouse talent. She delivers a solid comedic performance as the Frau Blucher-esque Pukina Bucket, which soars above the expectations laid out by some of the character's dialogue. But it's when she opens her mouth to start singing that the real magic starts. Olson's voice booms with a silky siren's call, compact with confidence and magnetism. Seeing her command the stage felt like one of those moments to cling to, so you can look back one day and say, "I saw her perform before she was famous." While the first act is a bit shaky at times, the second act is a solid block of laughs and gags. 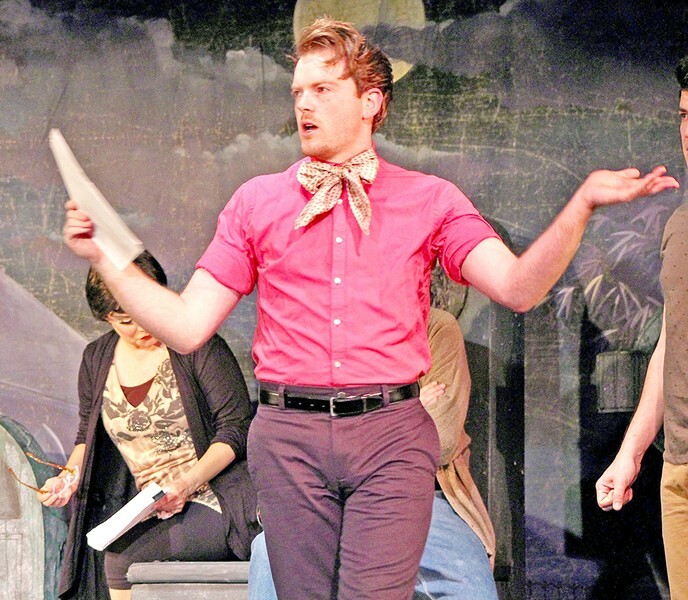 Eric Stein, the play's director (who is also the casting director and associate artist for the Pacific Conservatory Theatre, PCPA) brings a mammoth comedic stroke into every nook and cranny of the script. It's moments when the Melodrama goes full meta meta that makes it an extraordinary experience. Moments like pulling out Marvin Hamlisch and Edward Kleban's "What I Did For Love" for a tongue-in-cheek group number that calls to the dormant theater geek in all of us (don't lie, you know you had a solid performance of that song in your back pocket at every audition you ever went to). Or the subtle nod to "Think of Me," one of the original musical's defining numbers that the Melodrama winds into an important plot point. These are the little references every true musical theater fan lives for, things that get you giddy, make you squeeze your partner's hand in the dark and whisper excitedly, "Did you get that?" Sun Arts and Lifestyle Writer Rebecca Rose salutes all the hard working wigs of the greater local theater community. Contact her at rrose@santamariasun.com.